Have you seen the search icon with toggle effect on many popular websites? Take a look at our sister project List25 for an example. The idea is to display a simple search icon, and when the user clicks on it the search forms slides out also known as the toggle effect. 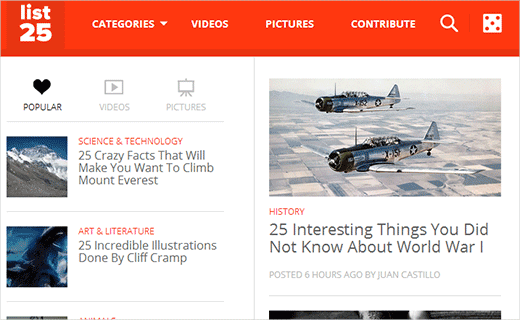 It is a neat effect that also saves space and allows your users to focus on the content. Not to mention, this is great for mobile responsive themes. In this article, we will show you how to add a search toggle effect in WordPress Themes. Note: This tutorial is for intermediate users with working knowledge of WordPress template tags, HTML, and CSS. Beginner level users are advised to practice on local server first. WordPress adds default CSS classes to HTML generated by various template tags inside a theme. WordPress themes use <?php get_search_form(); ?> template tag to display search form. It can output two different search forms, one for HTML4 themes and one for themes with HTML5 support. If your theme has add_theme_support('html5', array('search-form')) line in functions.php file, then this template tag will output an HTML5 search form. Otherwise, it will output HTML4 search form. Another way to find out what form your theme generates, is to look at the search form source code. And this is the form it will generate for a theme with HTML5 support. Once you have made sure that your search form is generating HTML5 form, the next step is to place the search form where you want to display it with the toggle effect. First thing you will need is a search icon. The default Twenty Thirteen theme in WordPress comes with a very nice little icon, and we will be using that in our tutorial. However, feel free to create your own in Photoshop or download one from the web. Just make sure that the file is named search-icon.png. Now you need to upload this search icon to your theme’s images folder. Connect to your website using an FTP client like Filezilla, and open your theme directory. The important thing to note about this CSS, is the CSS3 transition effects which allows us to create the toggle effect with ease. Also note that you will still have to adjust the positioning of the search icon and form according to your theme’s layout. 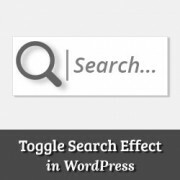 We hope this article helped you add search toggle effect in your WordPress theme. What are your thoughts on the toggle search form? We’re seeing more and more sites using this effect. Leave your feedback and questions in the comments below or join us in the conversation at Google+. Is it possible to implement this only on mobile? My theme has a nice animated search function on desktop, but only a toggle to show/hide search box in place of my logo on mobile. Hi. Thank you very much for this code. I did have to play around with the positioning to get the search button to appear where I want it, and since I only wanted it to appear in the mobile version, I also added css to the media query for over 800px screens to show the full search field instead of the icon. I got it working great, but I do think it’s a little complicated for folks who just want something to basically plug and play. Also, I want to add that I am using a Twenty Twelve child theme, which comes with the HTML4 search code. Adding the HTML5 support to the functions.php did not fix it, so I copied and pasted the HTML5 search code that you posted above into my theme header where I wanted to search box to be. I was so hoping this would work for me. I pasted in the code in the Additional CSS area of my theme (twentytwelvechild), added the search-icon.png to my theme folder using FTM and added add_theme_support(‘html5’, array(‘search-form’)); to my theme’s functions.php file. I see no change and wonder what I have missed. I hope someone can offer me a clue. thank you. Do you think there’s a way to make the search field appear from right to left (unlike from left to right like now)? It slides to the other side. Yeah… just like I thought, this doesn´t work at all. How is it supossed to work with no JS anyway? Instead of JS, this technique uses CSS. Thanks for the code… Is this responsive? I mean, I want the search field is fully showed when in mobile. Is it possible? I got this working on genesis but my search form is in my nav bar, and when the screen width is relatively too small, the search form moves down. I got it working on Genesis. You have to move the search-icon.png into your genesis child theme images folder. Then, depending on where you put your search form, mine is in the nav bar so it is slightly different, you adjust the css style to your likes. I had to modify the “.genesis-nav-menu .search input” class to get it working. Hi Cassy, Can you give a little more info on how you modified the .genesis-nav-menu .search input class? I can’t seem to get it working. Thanks! Hi! I’m using Genesis and I can’t get this effect to work. Any tips as to why? yea the same problem im on genesis with enteprise pro theme doesnt work. Anyone who has solution to make this work on genesis..
this is really great! Is it possible to get the icon to sit static at the right while the form slides out to the left? I can’t seem to figure it out! Greetings – Thank you for this great bit of code. I’ve tried inserting it into a client’s site that I’m working, using the HTML5 version of the code, I placed the extra bit into functions.php and added all of the css. I put in a search icon and got the form to show up how I want on the site – it will even do all of the toggle-ing effect as desired – but when I enter text that I want to search to test it out, I can not submit the search to view search results. We are using a woocommerce theme, “Mystile”, which has a default search form (which works when entered) but I much prefer the looks and functionality of the form as mentioned on this page. We tried putting the wocommerce search form code side by side with the code you gave above, tried swapping out bits and pieces to “merge” the two…but no luck. Any reccomendations would be extremely helpful. There could be many things that may cause this, it is not possible for us to help out with theme compatibility issues. But what I am exactly looking for is that how to display Google Search along with Blog search as found in popular blogs like ListVerse and others. Please guide me through this! Take a look at our guide on how to add Google search in WordPress. Another great tutorial. I will add this to my site-just because it’s cool. Code looks fabulous , I appreciate your efforts , surely gonna try this one for my word press project . A demo would be helpful.. Also what does the use of role=”search” attribute in the form tag, what is the attribute “role” used for? I have been looking for a simple tutorial on this. Thanks! Have you done one yet on the sliding menus like those on the Facebook mobile app? These menus are becoming very popular, even for desktop apps. Actually we have, checkout how to add a slide panel menu in WordPress.